This simple adjustable electronic flasher circuit uses a relay controlled by a transistor, so that its frequency can be adjusted easily with a trimpot (trimmer potentiometer). See the video when the circuit is tested for frequency adjustment. Also watch the video when the circuit is connected to the third brake light on the car, or the center brake light. The following is a list of components that are simple and inexpensive but effective as the above schematic. Relay (R) is SPDT five pins. SPDT stands for Single Pole Double Throw. Two pins of the relay are used to activate the solenoid, and the other three pins as switches. See the relay switch circuit, NC (Normally Closed) pin is connected when the relay is off, this pin is connected to the bulb and supply current to charge the condenser (C). This flasher relay will turn on the brake light if the relay is not active. The relay will be active when the condenser voltage is above 0.6 volts. If the relay is active, the current to the lamp and condenser will be disconnected, because the relay connects to the Normally Open (NO) pin. The brake light will turn off. The condenser supplies current to the base of the transistor, the transistor connects the solenoid to negative. So the relay will be active for a while, and the brake light will still off. 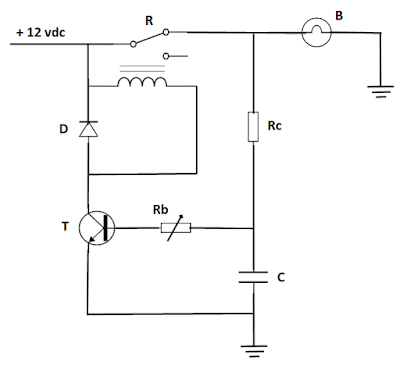 When the condenser voltage is lower than 0.6 volts, the transistor cuts the current and the solenoid relay will off. Then the NC pin will be reconnected, the light is on and the condenser is charging again. And the cycle will continue. 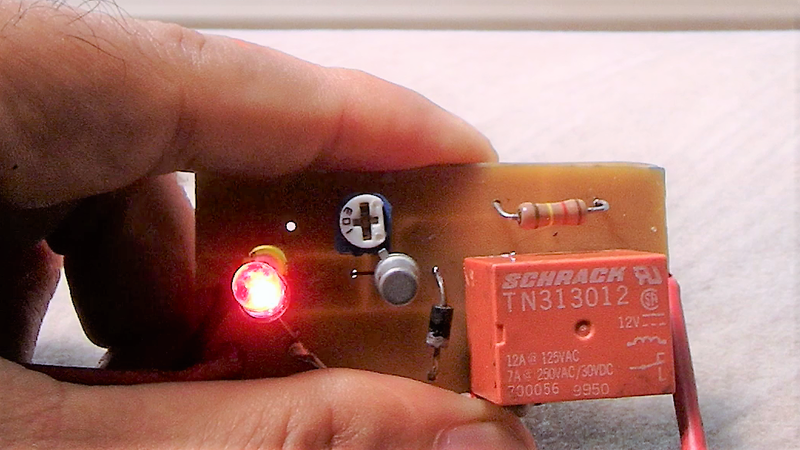 As shown in the circuit photo, the 12 volts relay is an orange colored Schrack type TN313012. This relay allows direct current at a maximum of 7 amperes. So for 12 volts, the maximum load power relay, in this case the brake lamp, is about = 12 x 7 = 84 watts. Diode (D) will short high voltage (spike), which arises when the current to the solenoid is cut off. This spike can damage the transistor. The spike arises because collapsing solenoid magnetic field induces a high voltage in the opposite direction of supply current. That is why this diode is installed backward. The BC109C is an NPN transistor switch (T). This transistor will allow the current from the solenoid relay flow to negative when the voltage at transistor's base is above 0.6 volts. This transistor has a metal body. So if it is overheated, a cooling fin can be installed. From the test results the temperature of the transistor does not rise even though the flasher is tested for several hours. Trimpot (Rb) with a value of 10 kiloohms will determine the length of time to discharge condenser. So it determines the length of time of activating relay and the light is off. The frequency can be changed when this trimpot is adjusted. The greater the Rb value, the longer the condenser is discharging, the longer the light off, and the lower the frequency. The 120 kiloohm resistor (Rc) determines the length of time the condenser is charging. In other words, the duration of the relay is inactive and the light is on. The greater the value, the longer the light on. This resistor also determines the amount of current supplied to the transistor base. So it determines the amount of current supplied to the relay solenoid. 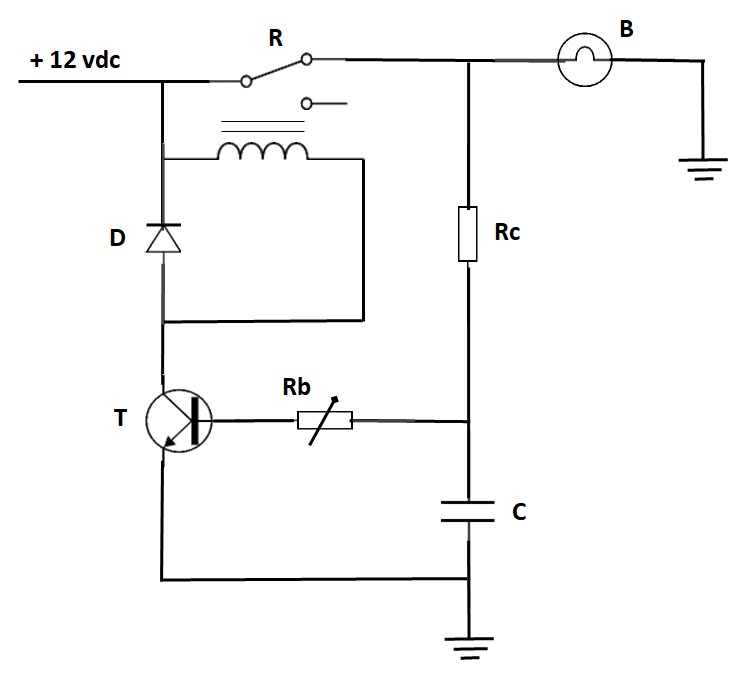 If the relay current is too small, the relay is difficult to activate. From the test results it is known that Rc resistant value 330 kiloohms will make the relay difficult to activate. Actually the Rc can also be replaced with a trimpot, so that it can be adjusted. But too many adjustments can also be troublesome. The transistor also has a maximum base current limitation, so if the Rc is replaced by the trimpot, then the risk of the maximal base current is exceeded and the transistor will be damage. The 33 microfarad condenser (C) determines the length of time of the light to turn on, and also determines the length of time of the light off. The greater the value, the lower the frequency. The brake light (B) is connected to the Normally Close (NC) pin of relay. If the system does not work, the brake light will remain on but not blinking. So with this design, it is still safe for the car or motorcycle that using this circuit, although it is not function properly. The video shows an LED light as an indicator. If you want to add a 5 mm LED light, it is simple by connecting LED to the relay pin using a resistor with a value of about 2.2 kiloohms. The LED will light up quite brightly. Installation of LED can also be read on simple relay flasher articles. 12 vdc input voltage is connected to a positive wire of the brake light wiring, or a positive wire from the brake pedal switch. This circuit can also be applied as a turn signal flasher relay. An easy way to make a printed circuit board (PCB) for this circuit can be read in the article making PCB without chemical. Flashing brake light is a very new technology. So the regulations are still ambiguous in several places. For this reason, it takes the viewer's discretion to apply this circuit on to car or motorcycle. The purpose of the flashing brake light is to make it more visible. Because the tail lamp (rear light) has the same red color as the brake light. Some manufacturers such as Mercedes Benz, Volvo, BMW, Honda have applied brake light that can flash on several models of car and motorbike. Currently at the rear end the Formula One (F1) race car, there is a flashing red light. That flashing red light is activated when conditions are critical (such as: rain, fog), or when the car harvests electric power from the wheel (kinetic energy) to charge the battery in the turbo hybrid system. Charging the battery will make the car slow down and be used when entering the bend, similar to braking technique by engine brake. Furthermore, battery power will be used for acceleration, such as when exiting a bend.